If you have the IFTA license, you must file the Quarterly IFTA tax return to your base jurisdiction, even if the licensee does not operate or purchase any taxable fuel in an IFTA member jurisdiction during the specific quarter. You will need to separate your mileage and fuel records for each fuel type. 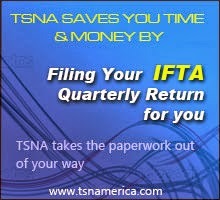 December 31, 2013 will mark the end of the 4th Quarter for IFTA and the deadline to file your return is January 31, 2014. If you operate in New York, Kentucky or New Mexico you will also need to file a Weight Distance Tax Return, in each state and that deadline is also January 31st. Do it yourself, you can calculate your own return by hand and mail or e-file the return. To find out the current tax rate for each state go to www.iftach.org. Use a software program that will calculate your return for you, like ExpressIFTA.com, which will reduce the chances of miscalculations. Use Truck Services of North America and let us take care of preparing and filing the return for you. Regardless of the method you choose to file your quarterly tax returns, it is crucial to maintain accurate records and file your returns on time to avoid fines and penalties.